Want to know how to activate dark mode on iPhone 7? Read this tip and grab this skill within simple steps. PhoneRescue does a great job on retrieving your important iOS data from the device itself, iTunes backup, and iCloud backup. When iOS 10.3 was ready to be released, it was highly expected that dark mode would finally come true on iPhone/iPad/iPod. We say “finally”, because there has been the rumor about dark mode since iOS 10 was released. However, this does not mean there is no way to get dark mode on iPhone 7, or other iDevices. iOS 10 brought a new feature of Night Shift, which is able to reduces the amount of blue light emitted by an iPhone or iPad display at night. You can enable this function by this tip: How to Turn on Night Shift Mode on iOS 9.3 >. But to be honest, it does not help a little at all to make text or words more more visible in low light situations. In this situation, what else way can we use to activate dark mode on iPhone 7? Luckily, dark mode is available in many iOS apps, even though it is unavailable in system-wide for the time being. In this tip, we are going to learn about how to enable dark mode in Safari app, to ensure you read any page on the web in light text on a black background. Step 1. 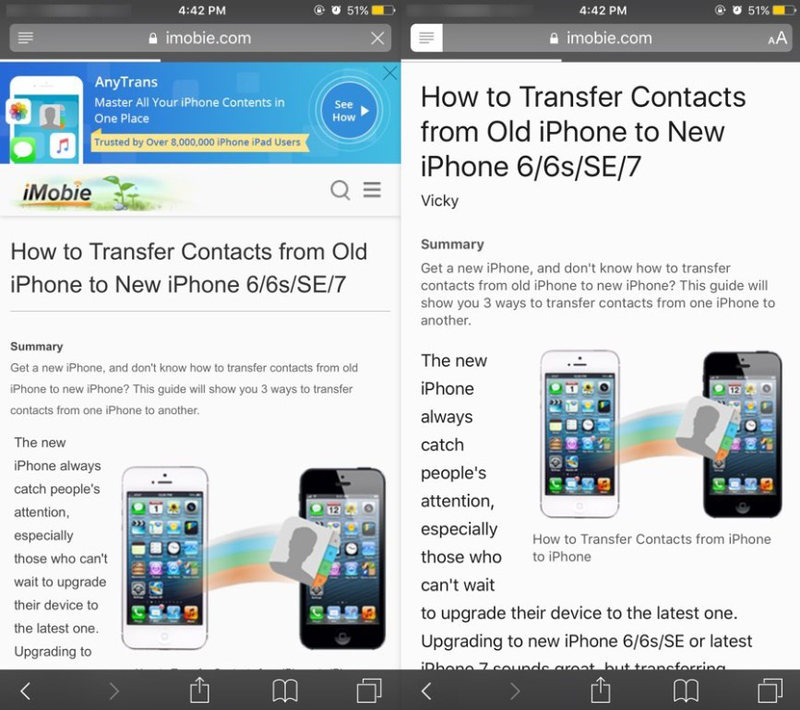 Open Safari on iPhone 7 with one page you plan to visit. Step 2. Tap the reader mode icon in the left corner of the URL bar, and you will see an “aA” icon in the right corner of the URL bar. Step 3. Tap the “aA” icon in the right corner of the URL bar, and it will show you four circles with different colors. Step 4. Tap the black circle all the way to the right in the top row of the drop down menu. Choose one you prefer for better reading. Besides you can also choose different Font, such as Athelas, Charter, Georgia, etc. To get dark mode on iPhone 7 is just as easy as we show above. 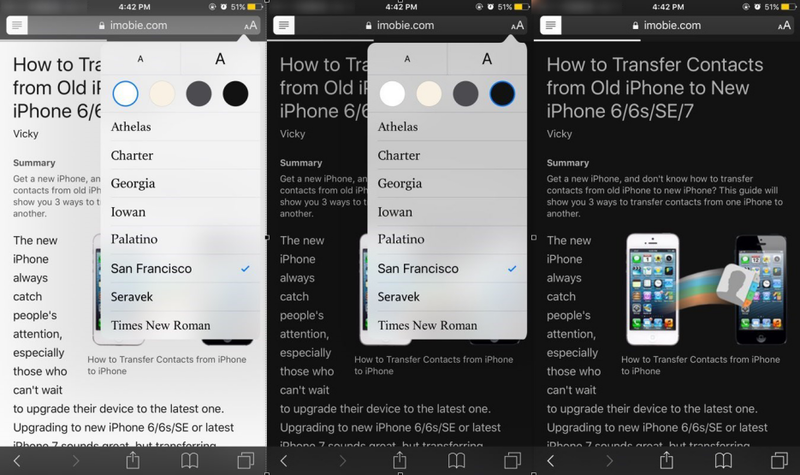 You can try these steps to activate dark mode in Safari on iPhone 7 now. If you have any other question, just leave messages in the comment below.